"You couldn't be kindred spirits with a beetle . . . could you? " Opeie was adamant on the build up to world book day that he didn't want to dress up. He just wanted a day of reading and to take cake and biscuits in for the staff at the library to say thank you for all the books they have ordered in for him in the last 12 months. 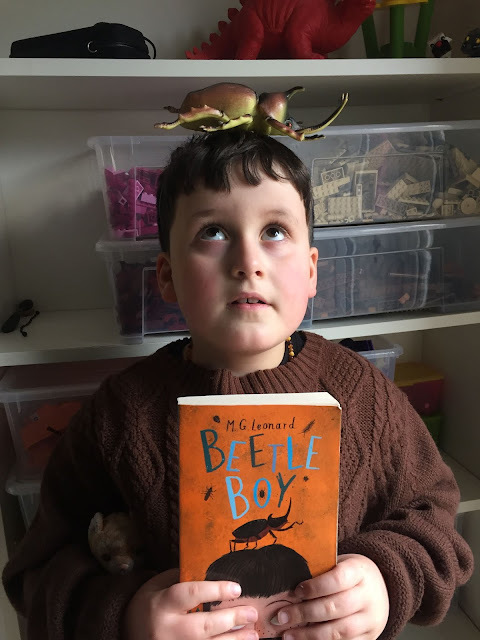 That of course all changed on the morning of world book day when he informed me that he did infect want to dress up and as expected he wanted to be Darkus from M.G, Leonards Beetle Boy. So we quickly headed out mooching around our local charity shops for an oversized brown wooly jumper and a headband to hot glue his beetle too. Im So glad he chose something doable on a short timescale. With the costume complete we headed down to the library with our gifts for the staff and came away with a handful of new books for an afternoon of reading. It was a pretty awesome world book day.